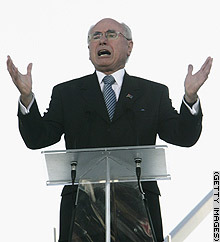 CANBERRA, Australia (CNN) -- Australia's conservative Prime Minister John Howard said Sunday that victory for Democratic Sen. Barack Obama and his party in next year's presidential election would be a boon for terrorists. "If I were running al Qaeda in Iraq, I would put a circle around March 2008, and pray, as many times as possible, for a victory not only for Obama, but also for the Democrats," Howard said, speaking on "Sunday," a TV show on Australia's Nine Network. March 2008 is when Obama has said he would bring U.S. troops home from Iraq, according to legislation he introduced in the Senate. Howard -- who faces reelection this year -- is a staunch supporter of President Bush and committed Australian troops to help the U.S.-led invasion of Iraq in 2003. Like Bush, Howard has come under increased criticism at home for supporting the unpopular war. Australia has more than 1,000 troops in and around Iraq, many in non-combat roles. Obama, campaigning in Iowa, told reporters Sunday he's flattered that one of Bush's allies "started attacking me the day after I announced (his presidential run) -- I take that as a compliment." The Democratic presidential hopeful said if the Australian prime minister was "ginned up to fight the good fight in Iraq," he needs to send another 20,000 Australians to the war. "Otherwise, it's just a bunch of empty rhetoric," Obama said. The Illinois Democrat dismissed the suggestion that his election would help terrorist groups, noting that even the Bush administration's "own intelligence agencies have indicated that the threat of terrorism has increased as a consequence of our actions over there." When asked about Howard's comment, a senior White House official voiced support for the Australian leader. "Prime Minister Howard knows that setting a timeline for a withdrawal sends the wrong signal to our enemies and sends the wrong signal to the Iraqi people," the official told CNN. Australian Prime Minister and staunch Bush supporter John Howard said a victory by Democrats in '08 would help terrorists.